It’s bad enough to suffer an injury that prevents you from participating in your favourite hobby, activity or sport. But what about when the injury gets so bad that it interferes with basic chores around the house or tasks at work? If you are suffering from elbow pain and swelling, this could very well be the case for you. But don’t worry, I’m going to show you a few simple, easy-to-follow steps that you can do right now to stop a swollen and painful elbow. When your elbow swells and is painful to the touch, it is no laughing matter. We rely heavily on the use of our arms everyday to perform even the most basic tasks such as carrying a grocery bag or briefcase, turning a doorknob to open a door, twisting the lid off a jar and even shaking someone’s hand. But what if all of these movements cause severe elbow pain plus to make matters worse, you are also experiencing some elbow inflammation. What exactly does this mean? Is this an “injury” that will simply get better with some rest and time off? For the majority of individuals suffering from elbow pain, they don’t even realize that they have suffered an elbow injury and may choose to ignore it or take the “wait-and-see” approach. If this is the case for you, then I must tell you that this is a critical mistake simply because it can actually make your injury worse and even prolong your recovery time. Your elbow pain and swelling can be caused by a couple of different situations. Perhaps you’ve just bumped your elbow or taken a fall or blunt force trauma to your elbow. If this is what has happened to you, simply icing your elbow 3 times a day for 10 minutes each time, over a 48 hour period will help eliminate your pain and inflammation. 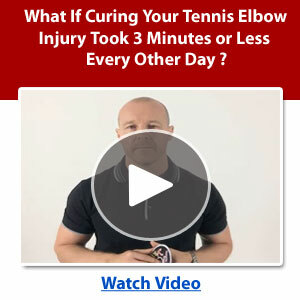 If your swollen elbow and pain has appeared out of nowhere and you have no clue on how this has happened, then there is good chance that you have something more serious going on in your elbow and have possibly suffered a serious elbow injury. Especially if you are past the first 48 hours and icing your elbow has not reduced your swelling and pain. It is important to identify the location of your pain and inflammation. If the location is on the outside of your elbow, then there is a strong possibility that you have suffered an elbow injury commonly referred to as tennis elbow. I must point out that you don’t have to be a tennis player or even pick up a tennis racquet to suffer from this injury. Over 95% of individuals diagnosed with this injury every year don’t even play tennis. It’s only called tennis elbow because the first ever reported case was by a tennis player – so the name stuck. So if you are have a swollen and painful elbow combined with ANY of the 7 symptoms mentioned in the list, then my friend you are suffering from tennis elbow. Now before you run off to the doctor, wash down fistfuls of anti-inflammatory pills, waste money on elbow braces/straps, smear on useless muscle rubs or anti-inflammatory creams, or worry about having to get cortisone shots, let me share my story with you. 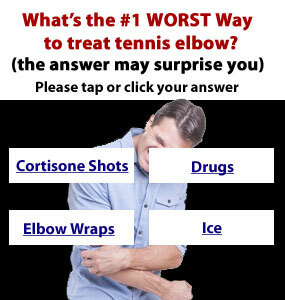 I know exactly how you feel right now because many years ago I too suffered from tennis elbow. But not only did I suffer with the elbow swelling and pain for 7 years but I shelled out over $780 of my hard earned cash on the so called “traditional treatments” for tennis elbow mentioned above. And I don’t want you to go down this path, you’ve suffered enough! It wasn’t until I discovered these 5 easy-to-follow, techniques that I did from the comfort of my own living room, sitting in a chair watching television – without any special exercise equipment or medical gimmicks, that my tennis elbow was completely gone for good! And yours can be too, starting today – right now!